"Easy Access from all over the World"
Erciyes is the the most centralized ski resort of the world by its geographical position. It is possible to access to the 1/3 of the World by a 4 hours flight from Turkey. 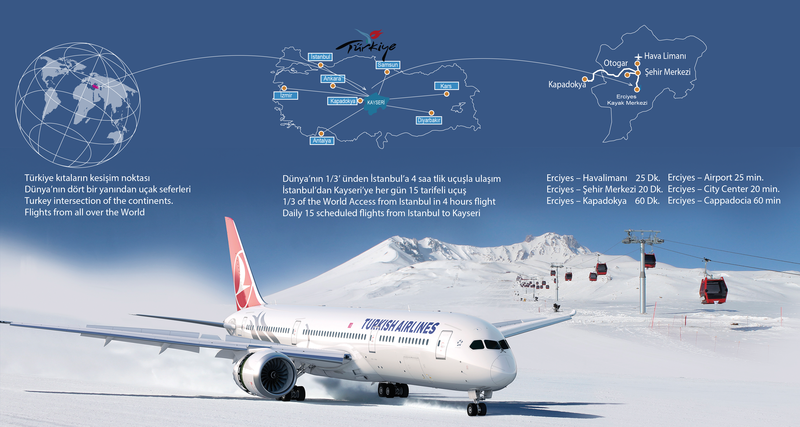 From Istanbul to Kayseri there are daily 15 scheduled flights in a considerably, economic and comfortable. One hour flight distance from Erciyes to Istanbul makes Erciyes ski resort quite attractive for local and foreign tourists. On the other hand, Erciyes Ski Resort is just 25 minutes to Kayseri Airport, 20 minutes to Kayseri city center and 60 minutes to Cappadocia. Transportation is provided from the city center to Erciyes with double highway in comfort. You will spend mountain nights in the hotels on Mt. Erciyes and experience the warm ambience with the fresh air of the mountain, or will prefer tos tay in high class gblobal hotels in Kayseri. 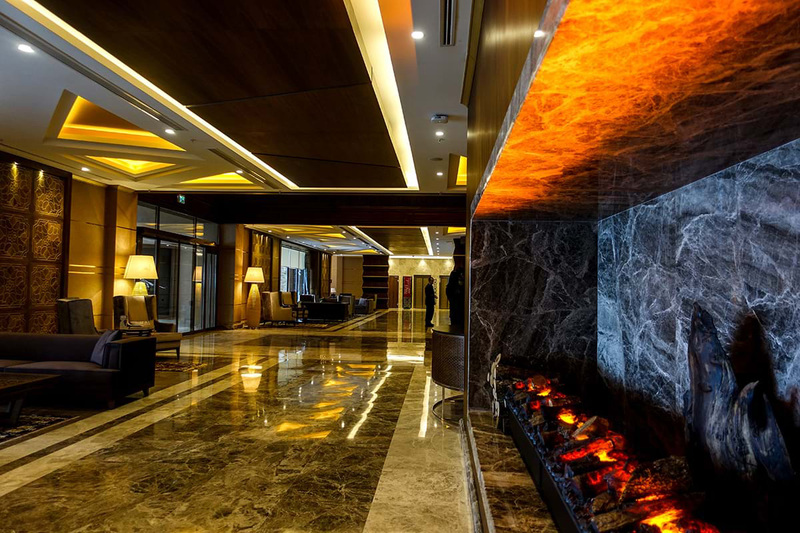 Hotels on Erciyes Mountain present a luxury accommodation experience with their architectural design in conformity with the mountain concept. The famous worldwide branded hotels in Kayseri city center provide the opportunity to stay in the city with the advantage of transportation and vsiting Mt. Erciyes for skiing daily. Shopping in the city center of Kayseri, exploring history of the city and experiencing delicious tastes of Kayseri are among the reasons which make accommodation in the city center attractive. 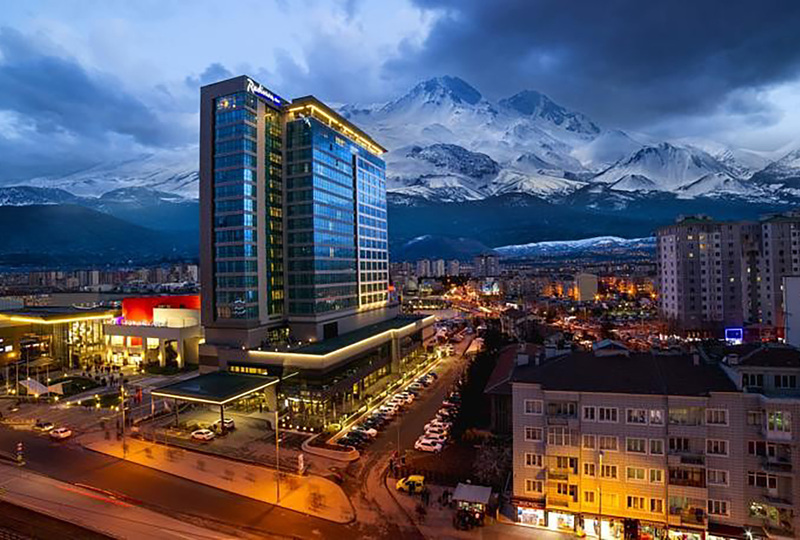 Worldwide brand hotels in the city center of Kayseri provides accommodation in the city center with the advantage of easy access to Erciyes for skiing on a day-to-day daily basis. The opportunity to shop in Kayseri city center, explore the city's history and experience delicious Kayseri tastes is also among the reasons why it is tempting to stay in the city center. You have visited Kayseri for a commercial concerns but decided tos tay a few days more for skiing without any equipment. This is not a problem at all. 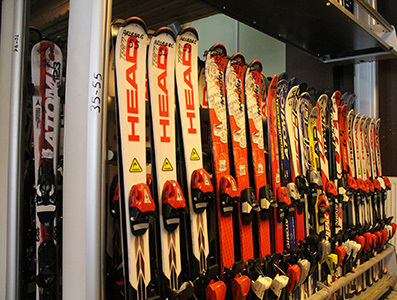 Rental shops are at your disposal for all kind of ski equipment with quite reasonable prices at each Gates. 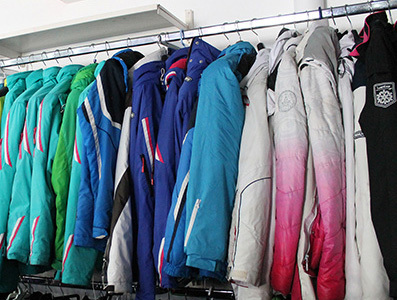 Ski and mountaining equipments rental for men, women and children have been serviced for your disposal by our rental shops such as Arlberg, Doruk, Kartanesi, Kuzey, Snowstar and Zumrut. Whats is more, even if you do not know skiing but want to learn with that occasion, our internationally licenced ski instructors will help you at SnowAcademia Ski School. Tickets are for personal use and may not be transferred to other persons. Tickets are only valid for the facilities owned by Kayseri Erciyes A.Ş. on the days when these facilities are open for public use. Accidents that will occur while skiing shall become the responsibility of the skier. Kayseri Erciyes A.S. shall not be responsible for the damages resulting from the accidents. Ticket bought shall not bring the ticket holder in any insurance right. Each ticket holder is responsible for taking out his/her own personal insurance. Ticket shall not be renewed in case of loss or damage in any way. Each guest is liable to submit his/her tickets to the employee in charge on demand. Criminal proceedings shall be applied upon determination of the fake or invalid ticket use. 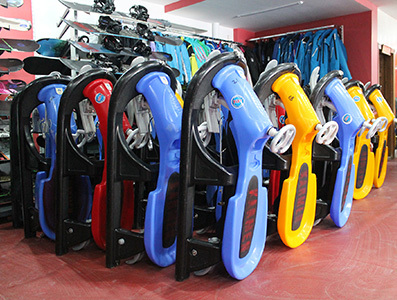 The ticket holders must comply with the usage rules of the runs(LIFT&SLOPES). Tickets of the ones who behave in a way that threaten safety of others shall be cancelled and use of the and facilities(LIFT and SLOPES) shall be prohibited.